Italian Interior Minister Matteo Salvini lashed out at the toll operator of the Genoa highway, Autostrade per l'Italia, whom he claimed should have made adequate repairs as authorities scramble to bury the dead of the bridge collapse that has now killed 40 (with dozens still missing under the rubble). Italy is still reeling from the shock of seeing dozens of vehicles fall 148ft from the Morandi bridge during torrential rain two days ago. 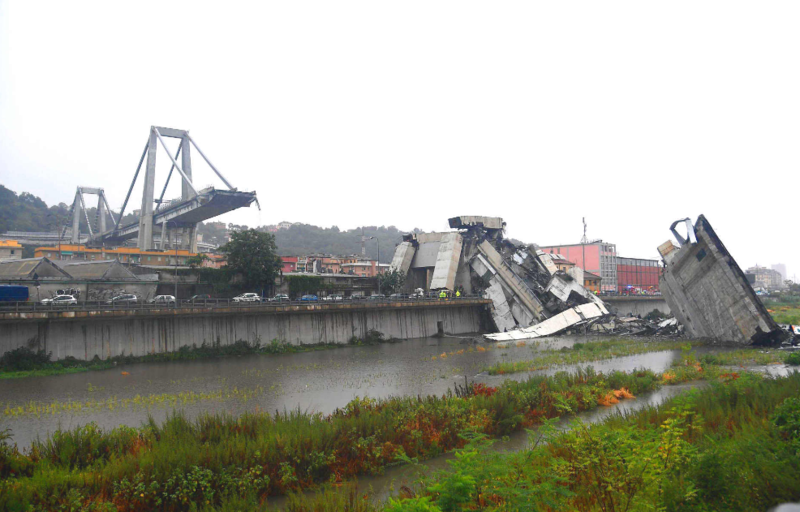 The anti-European populist government of Lega Nord (Mr Matteo Salvini) and the Five-Star-Movement (Mr Luigi di Maio) were equally quick to blame the toll operator of the highway, Autostrade per l'Italia, whom they say did not adequately repair the viaduct which collapsed. Deputy Prime Minister Mr Luigi Di Maio threatened today that Autostrade per l'Italia's might be taken into state control, saying: "It's not possible that someone pays a toll to die. Those who were supposed to do the maintenance work did not do it properly. That bridge should have been closed before this tragedy happened." Shares in the holding company, Atlantia, fell almost 30% on the Milan stock exchange from the previous close on the threat of the toll operator being taken into government control. Just as many Italians were outraged because of the disaster message on Autostrade’s website, informing its users of a detour that would be needed because of the collapse, a fuming Mr Di Maio declared to the Italian press that "while bodies were still being counted" the company was speaking about money it would get from cancelled contracts. "This is shameful, always thinking about profit." Interior Minister Mr Matteo Salvini declared that he would "do everything to get the names and surnames of the managers responsible."